When I was first approached about reviewing Cascade’s recycled cardboard tree, I was a bit reticent. We have reviewed several cardboard playhouses before, and they usually end up in the recycling bin after a few months, as they are simply not sturdy. I anticipated this cardboard tree would be similar…disposable after one holiday season. I am pleased to report I was wrong. Christmas trees epitomize the holidays, but each and every year, a great many real and artificial Christmas trees end up at the dump. This year, we invite one and all to choose Christmas trees made from 100% recycled cardboard, an alternative that leaves but a small ecological footprint behind. These revolutionary trees are cut from high quality cardboard, are made of recycled fibres and are as much fun as they are beautiful. When purchased in white, they become a canvas on which to unleash your holiday imagination -young and old can decorate them as they wish. Made of compressed cardboard, assembling this tree was a great exercise in spatial relationships for my kids. It is surprisingly very sturdy and can be reassembled year after year. I don’t see this tree replacing our living tree, but it is a very nice complementary decoration. Incidentally, Cascades holds the title of largest wastepaper recoverer in Canada. In 2009, more than 2.1 million tonnes of wastepaper and cardboard were reused as raw material in our plants, rather than decompose in landfill sites. Our facilities consume 6 times less water than the Canadian paper industry average. Would I buy this product? Yes, I might. I’m not one to spend money on decorations. I would rather make them, and I am not a big decorator for holidays. At $33.00, I think it is priced fairly, and if in the right holiday spirit, I might just buy this tree. It sure would be fun for a classroom holiday project too. Nature’s Gate was one of the first “natural” beauty companies I trusted because their prices were affordable. Since I discovered the brand used carcinogenic 1,4-dioxane in some of its products, I’ve steered clear. 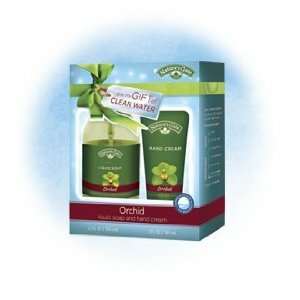 The Nature’s Gates holiday gift sets have not been tested by Environmental Working Group, so I am not sure if the company has cleaned up its act or not. When I searched 1.4 dioxane on the company’s website, I got zero results. Nature’s Gate has partnered with WaterAid to support the use of rainwater to help families and children in Asia and Africa have long term access to safe, clean water. We encourage you to get involved and help us reach our goals and deliver clean, safe water to children and families. Would I buy these products? No. Even though these products contain many organic ingredients, recycled packaging, no parabens, no sodium lauryl/laureth/coco sulfates, phthalates, and are cruelty free/vegan, I just can’t get past my suspicions and distrust about 1.4 dioxane. 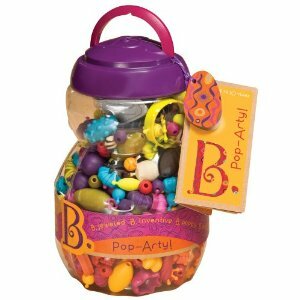 These snap together beads are festively colored and sure to appeal to children. Designed for ages four to ten, 500 pieces makes all kinds of jewelry. From toe rings to bracelets, children are sure to make many pieces out of this set. Battat’s new toy line, B., is quirky, eco-friendly, generous, aðordable, beautiful and poised to be a favorite for parents and children alike this holiday season! Definitely on the good list, B. is committed to our planet, dedicated to giving back to children everywhere, helpful to parents and bringing fashion-forward colors into the world of toys. This toy is phthalate-free, and a portion of sales helps end childhood poverty. The packaging is made form PET that is recyclable. Still, I wouldn’t exactly call these green toys. Our materials vary depending on the type of toy and the age for which it is designed. We use wood, plastics, cloth, ribbon and many other materials. Nothing we use contains any lead or phthalates. In addition to carefully choosing materials for our toys, we are passionate about the materials used to make our packaging. Read more about our eco-friendly packaging. Packaging alone does not make a product green. I would much prefer my children use [amazon_link id=”B000GIPOJS” target=”_blank” ]wooden beads[/amazon_link] than plastic ones, as well as use their fine motor skills to bead. I associate snap together plastic beads with younger children. Would I buy this product? No. I think $42.99 is a lot of money, and I avoid all plastic, phthalate-free or not, at all cost. A plastic toy has to something really special for it to be in our home. This just doesn’t qualify. 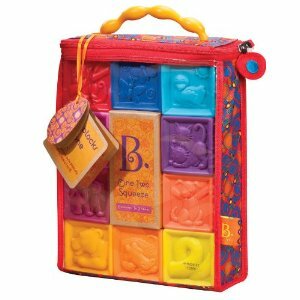 These blocks remind me of the classic squeezy blocks I probably played with as an infant, although they are probably safer since they are phthalate-free and BPA-free. We built our toys sturdy so they could be recycled the old-fashioned way – by being passed from one child to another. When everyone in your family is finished playing with a toy, please check out earth911.com. You’ll find wonderful opportunities in your area for passing along a toy to someone who could use it next. Would I buy this product? No. Unfortunately, my feelings are the same for this B. Toy as the one described above. Although these blocks are more reasonably priced ($14.95), the packaging is eco-friendly, but the toy itself is not. B. Hellophone created by DoodleDoo Battat Inc. It’s for you! The play cell phone that calls you back. B. Chatty B. Friendly B. Busy B. You B. ready for the party! Simply peel off the reusable stickers, slide the tabs out, tlip this reversible jacket over and wrap it back around the toy. Now you have a B.eautiful wrapped gift. Happy Anything! Parents can record messages for kids to discover. 3 pre-recorded messages and lots of sounds and songs. For ages 18months to 5 years. I am not a fan of electronic toys. Although it is cool you can record your own message on this phone for your child, I feel this is a toyed designed for adults, not a child, as described in the presentation on neurology I recently attended. What 18-month-old needs a cell phone? It is true that children learn through imitation, and it is natural for a young child to pretend to talk on the phone like mommy and daddy. That being said, it is much better for their imagination, and thus cognitive development, to pick up a wooden block and pretend it is phone than to use a plastic, electronic toy. B. nice to the planet. The difference in our packaging goes way beyond the surface. We scrutinize every piece to ensure its impact on our children’s world is as light as possible. Our inks are soy-based and our varnishes water-based. 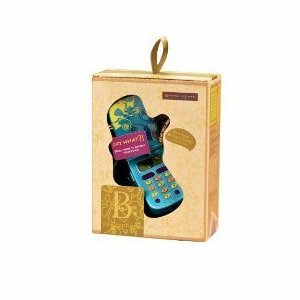 Reversible packaging, as found on this toy cell phone, is a unique idea I hope other companies will embrace. Would I buy this product? Obviously, no. Jennifer, as always a great review. I was curious how the Cascades tree held up too. In fact, I also listed on my site as well when I was doing a round-up of recycled content or re-purposed Christmas trees. Some very clever people out there. See http://bit.ly/fYLaL9. Feel free to link your review of Cascade tree to my article.